A magnet science project is interesting because of the wide variety of questions that can be asked involving magnets. Magnets are able to exert force on some objects without even touching them. able to put out its own permanent magnetic field. A magnetic field is like gravity in the sense that the further from the source the weaker the field becomes. Permanent magnets are fascinating because they can stay magnetised centuries. They can continuously attract or repel materials without any apparent energy input or usage. The following experiment is safe and relatively easy to perform, but a good knowledge of mathematics is required. I would say it is for older children who are able to apply maths affectively, but it can also be used for younger children by applying simpler maths. How does the amount of pull force a magnet exerts correlate with the distance between the object and the magnet? This experiment is quite straight forward pick a series of different distances the magnet is away from the piece of iron/ steel. These distances could be 10cm, 5 cm, 4cm, 3cm, 2cm, 1cm and direct contact as the control. Then you can use some maths to figure out how much more force is pulling the magnet towards the piece of metal. Is there a relationship between the distance between the magnets and the force they exert on each other. Once you have the points of data you can graph it (the graph will be non-linear and advanced). Could you construct a formula which would be able to predict the amount of force the magnet is pulling with by knowing the distance? To be able to measure the pulling force accurately you can use a Newton scale (sometimes they are used to weigh fish). You could try to make your own Newton scale by using an idea spring or you could use another method of measuring the force. 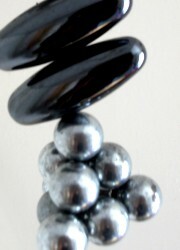 For further information on how to turn this magnet experiment into a science fair project check out this page. Go back from "Magnet Science Project" to home.